DREAM COME TRUE PARTY ROOM offers fun weekday activities and monthly special events for your child. Space is limited. Reserve your spot today. To purchase tickets to any of our special events online. Click on the Purple Pass link below. Drop the kids off for a fun evening of SLIME making, games, movie time with popcorn and pizza dinner. Come in your PJ's and bring a pillow and blanket. Space is limited. Advance reservations required. fairy Breakfast: Saturday, January 20th 9:00 a.m. - 10:30 a.m. 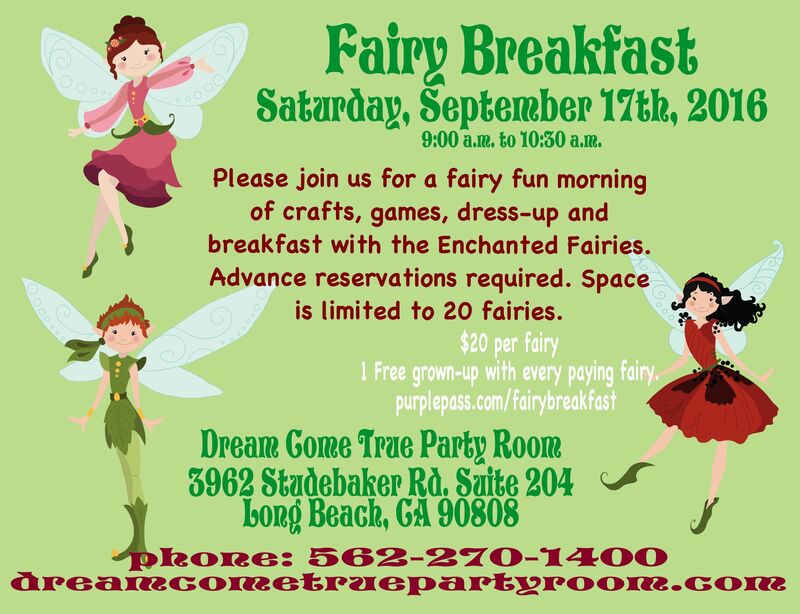 Please join us for a fairy fun filled morning of dress-up, games, face painting, fairy craft and breakfast. Space is limited. Advance reservations required. $25 per child. 1 free adult with every paying child.